Equine Raindrop Technique is a home remedies for horses modality that uses a combination of essential oils and holistic modalities to bring harmony back to the horse's body. From occasional sore muscles after exercise to support for a healthy immune system*, this technique can bring harmony back to the body. The Raindrop Technique was developed by Gary Young, ND a world known expert in the field of therapeutic grade essential oils and founder of Young Living Essential Oils. For a complete overview of the technique and the oils used, please click here. What is Equine Raindrop Technique? Dr. Heather Mack, DVM is an advocate of the Raindrop Technique for oils for horses. She coined the term Equine Raindrop Therapy; although technically it is a technique not a therapy. Since then she has become an advocate of Raindrop for horses and recommends that it be performed once per month to support the horses body in maintaining structurally alignment and energetically in harmony; as well as to support a healthy immune system*. I personally use Raindrop as an emotional release technique and understand that emotions are a very important component of a vital health. Healthy Immunity (Physical) + Happy Horse (Mental & Emotional) = Healthy Horse! Healthy horses are less prone to injury, enjoy their work and perform better on all levels. Wahooo! What are the Benefits of Equine Raindrop Technique? Other horses around the barn will love the smell of the essential oils! The oil blend of Valor is placed on the poll, shoulders and sacrum to balance the energies of the physical and emotional body. It is also placed on all four feet. On the coronet bands, Oregano and Thyme are placed where the meridians of the body end. A Vita Flex procedure is conducted also on the coronet bands to promote healing. Essential oils of basil, wintergreen, cypress, and peppermint are placed on the inside of the hind legs. A Vita flex procedure is conducted on the leg which stimulates the spleen, liver and kidney meridians. This also may be conducted on the front legs if dealing with an imbalance of the small or large intestine; lung or heart meridians. Oils of oregano, thyme, basil, wintergreen, marjoram, Aroma Siez, marjoram, Aroma Siez, cypress and peppermint is applied to the spine from the base of the sacrum to the withers. Vita flex techniques are also applied to the spine to stimulate energy pathways and allow the oils to go deeper into the tissue. Lastly, a hot towel is applied to the spine for about five minutes. 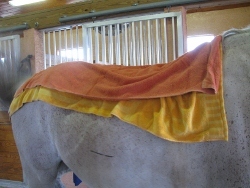 A light sheet or cooler is placed over the compress to keep the horse warm. While the horse is enjoying the hot towel spa treatment, other work such as emotional release and vita flex can be done on the neck and poll! Can I Ride my Horse Right after a Session? You probably can ride immediately after session if you absolutely have to; however, I find that it is best if the horse is not ridden for at least several hours. Most of the time, I perform the session after the horse is done for the day; then the horse can go back to regular work the next day. As with humans, it will depend on the horse and dilution may be required. I always wait at least 24 hours to ride; but most horses will not have to take any time away from training. Want to Purchase a Raindrop Technique Kit? The Raindrop Technique Kit comes with all the oils needed to perform a raindrop, plus vegetable oil and Ortho Ease Massage Oil. And a DVD demonstrating Raindrop on a person. How do I schedule a Raindrop for my Horse? To schedule a Raindrop Technique session for you or your horse, please contact me by e-mail or phone at 561-315-6334.